Why don’t white people understand that Converse tekkies are not just cool but a political statement to people of colour? Why is it that South Africans of colour don’t really ‘write what we like’? What’s the deal with people pretending to be ‘woke’? Is Islam really as anti-feminist as is claimed? What does it feel like to be a brown woman in a white media corporation? And what life lessons can we learn from Bollywood movies? In Sorry, Not Sorry, Haji Mohamed Dawjee explores the often maddening experience of moving through post-Apartheid South Africa as a woman of colour. In characteristically candid style, Dawjee pulls no punches when examining the social landscape: from arguing why she’d rather deal with an open racist than some liberal white people, to drawing on her own experience to convince readers that joining a cult is never a good idea. In the provocative voice that has made Dawjee one of our country’s most talked-about columnists, she offers observations laced throughout with an acerbic wit. 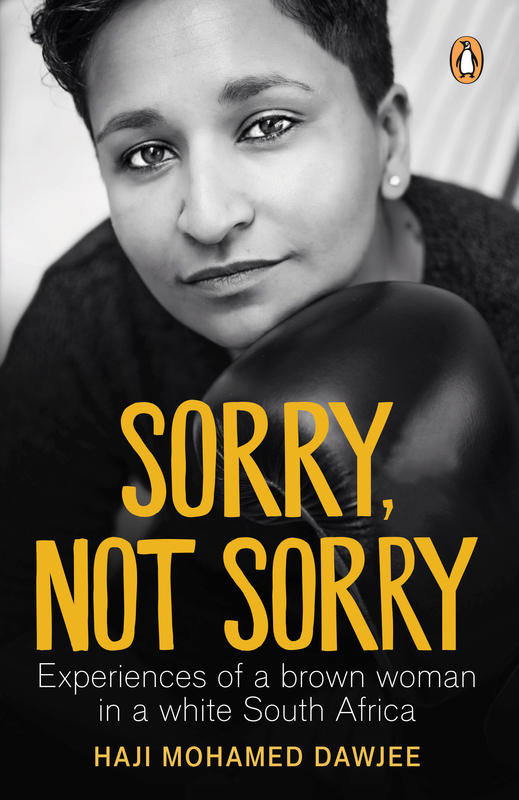 Sorry, Not Sorry will make readers laugh, wince, nod, introspect and argue. Born to a Muslim family in the apartheid township of Laudium, Pretoria, Haji Mohamed Dawjee came of age just as South Africa’s democracy was finding its feet. Opting out of the favoured family profession of dentistry, Mohamed Dawjee graduated with a Bachelor in Music from the University of Pretoria before teaching music and English second language at the American International School for several years. Deciding that the world of education was far too sensible for her, she turned to the more chaotic universe of the media. Mohamed Dawjee completed a postgraduate degree in journalism at Stellenbosch University and after graduating rapidly established herself as a digital media specialist. She became Africa’s first social media editor in a newsroom at the Mail & Guardian, where she went on to work as deputy digital editor and a disruptor of the peace through a weekly column. A stint as the program manager for Impact Africa – a grant-disbursing fund for African digital journalists – followed. In 2017 Mohamed Dawjee was selected as a fellow for the Deutsche Welle Insitute. Mohamed Dawjee now pursues her own writing full-time. She infuriates readers of EWN, Women 24 and the Sunday Times (to the same degree, she hopes) with weekly and bi-monthly columns, and contributes freelance journalism and opinion to a range of other publications.